Thai food is a fresh and delicious cuisine that everyone can enjoy, whether you are health conscious or love comfort food. 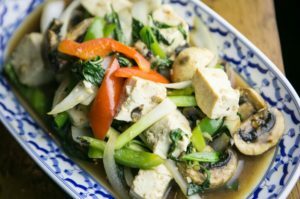 Thai cuisine is known for its fresh ingredients; an infusion of unique flavors and seasonings that make it memorable and satisfying. Intrigued? Here are some of the traditional ingredients in Thai cuisine that will have your taste buds dancing. The base of some of the most satisfying Thai dishes is Thai Jasmine white rice. This provides the perfect base for some of the richer, more flavorful spices in Thai cuisine, such as curries. Many dishes also contain different kinds of noodles as a base option. 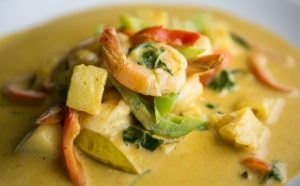 Try a little heat with our Curry Pineapple Prawn dish. Fish is another key component in most Thai food. For example, there are many Thai dishes that use shrimp paste to get a delectable flavor. Fish sauce is commonly used in Thai cooking. It contains fermented fish or other seafood-based ingredients. While Thai food contains many fresh veggies, it is also known for its spices, which give it a memorable kick. Many Thai dishes use chili powder and fresh Thai chili to add a little bit of heat. If you can’t handle extreme spice, don’t worry – Thai dishes are available with varying degrees of heat (our menu comes with spice levels 0 thru 4.) Chili is added to curries and sauces, and it’s also sometimes used to make chili paste dips that are eaten with vegetables and rice. Sweet Basil with Tofu, a fresh choice. Thai food also contains a wide variety of different herbs, which makes it very aromatic. When you first walk into a Thai restaurant, you will probably notice the wide range of appetizing aromas. One of the most popular herbs used in Thai cooking is the lime leaf, which is what often gives it its ultra-fresh finish. This herb is usually combined with lemongrass or even used with delicious Thai basil. Next time you are planning a dinner, whether it’s a date night or a family night out, consider convening at a Thai restaurant. We are the leading purveyor of authentic Thai food in the Seattle area, with locations at Pacific Place in downtown Seattle, Redmond Center, Bellevue, and Sammamish. Our delicious menu features dishes from every region of Thailand and we use the freshest ingredients available. We also have vegan and gluten-free options to cater to any diet.